The Gunpowder is flowing at 35 CFs, is clear and 54 F. The River still has plenty of fall color. Two anglers wearing capes took advantage of a half day of middle school and stopped in this afternoon before heading out to fish at Bunkerhill. Tricos in the morning followed by Blue Winged Olives and Caddis are all part of the mix now. Tired of hooking leaves? It might be easier, and more productive to fish dries-especially small ones. The muffin tins are full of Mike Bachkosky’s snowshoe rabbit midges and phunny emergers in the #18-22 range. Dreading the small stuff? If you have some hoppers left over in a terrestrial box drop any of these small patterns behind them on about a foot and a half of 7x. Daylight savings time is this weekend-a signal that both early voting and evening fishing is over. Sleep in and take advantage of mid-morning temperature swings. The trick to connecting with wild fish is to treat yourself to some time on the water this weekend. Please Note: The shop will be closed on this Monday, November 3 and will reopen on Tuesday at 10 AM. This entry was posted in fishing report on October 31, 2014 by Theaux Le Gardeur. THe Gunpowder river is clear, flowing at a near perfect 106 Cfs and is 55.5F. This week reports of Olives in the morning and Tricos mid-day at Masemore and Bunkerhill have been encouraging. 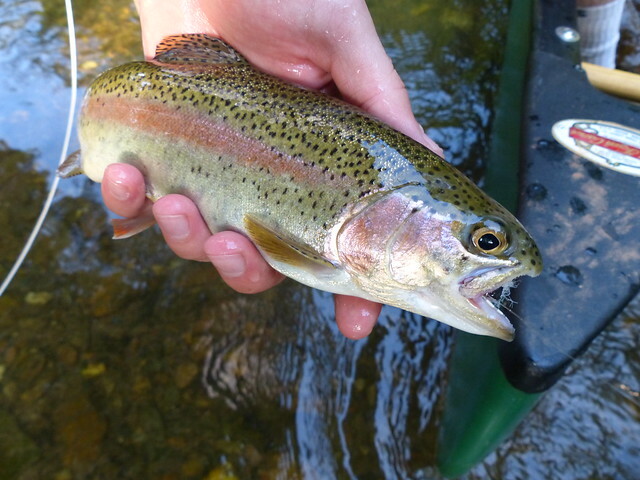 Folks have also been coaxing quite a few rainbows to take zebra midges throughout the catch and release area. 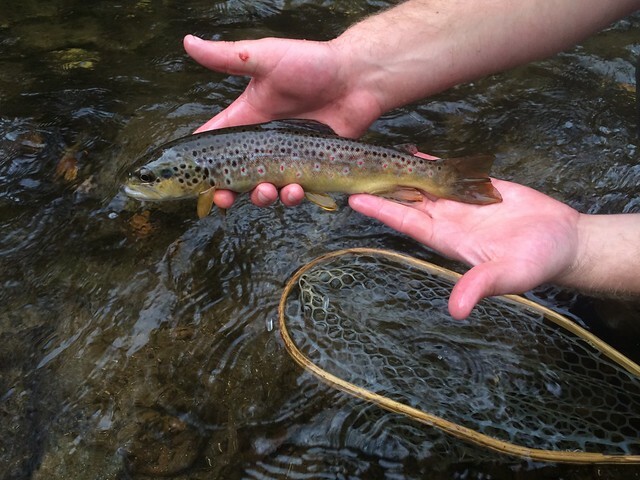 With flows back up from the 38 Cfs it’s loads easier to fish nymphs in the riffles under big yarn indicators and streamers, like Grey Ghosts and sculpins in the log jams. We’ve been checking in lots of cozy gear from Patagonia-including some Nano-Air jackets, Shelled insulator and R1 pants. With the weather getting colder wet wading in those old leaky waders might not be as much fun anymore. Stop in and check out what Simms just sent along, including some G4Z, G3 and Headwaters waders, Vapor Boots and Riffle Jackets. This entry was posted in fishing report, news on October 11, 2014 by Theaux Le Gardeur.